My sister, Dawn, and brother-in-law, Ara, visited us in Florida last week. They brought several gifts as a way to thank us for our hospitality – specialty chocolates, 2 dozen of our favorite chorags, made by the women at St. Leon Armenian Church in Fair Lawn, NJ, and a copy of their Women’s Guild ‘Hye Tea Social’ – 10th Anniversary recipe booklet created by Barbara Hovsepian, a long-time family friend. We couldn’t have been more pleased with these gifts – and, of course, their company. The Women’s Guild at St. Leon has a large, incredibly active, membership which organizes exciting functions throughout the year. For the past ten years the Guild has hosted a popular event generally held in the month of May called ‘Hye-Tea Social’. For their first Tea, each member was asked to bring their own favorite tea cup. Each year after that another item was requested – ‘hat, gloves, parasol, fan, nosegay, brooch, pearls, and shawl’. This year’s request was to ‘wear your Hye-Tea best!’ My sister reported that most came all decked-out for this festive occasion. Besides dressing to impress, the bite-sized refreshment assortment really takes center-stage. There is a dedicated committee which plans and prepares countless recipes to serve the eager guests. The Hye-Tea fare includes ‘traditional English tea items as well as some Armenian dishes’. 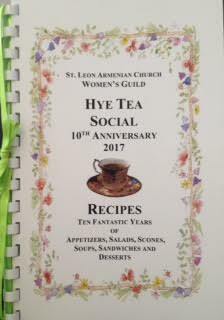 This year’s booklet contains many of the recipes they have served over the past ten years, and I understand the social attracted over 200 women (members with their mothers, daughters, and granddaughters). Very impressive! The Hye-Tea is all about the eye-appealing food, assorted teas, fun entertainment, and lively comradery. The menu varies from year-to-year, but favorite bites make it onto the menu year-after-year. Mix the ingredients together until well-combined. Spread on crackers or 3-inch lengths of celery stalks. Peel and chop the eggs. Add the mayonnaise, salt and pepper; mix to combine. Cut a small slice off the edge of each mini pita. Gently open and stuff with some egg salad. Gently push in some of the basturma slivers, leaving a little of the basturma exposed at the opening. Mix butter with sugar until creamy. Add salt, extract and flour; mix without over-mixing. Add nuts and mix lightly. Place dough in refrigerator for at least 30 minutes. Shape dough into 1-inch balls and place on ungreased cookie sheet. Bake until light brown, about 12 to 15 minutes. Cool cookies on rack. Shake powdered sugar over the cooled cookies.